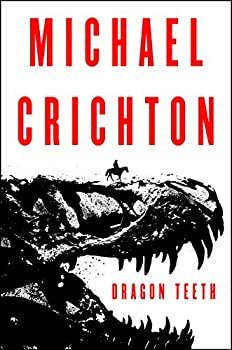 As anyone who reads the dust jacket will realize, Michael Crichton’s Dragon Teeth (2017) is about dinosaur fossils and the obsessed palaeontologists who traveled into the American frontier during the Gilded Age to gently dig them up. Sadly, it’s not about dinosaurs eating people. William Johnson is a student at Yale. The son of a wealthy Philadelphia family, Johnson goes west to win a bet against his rival. He joins Professor Marsh, an eccentric and paranoid man who specializes in the bizarre new science, palaeontology. It turns out that Johnson has entered the “Bone Wars” between Marsh and his nemesis, Edward Cope. Although I spent most of the novel expecting Johnson and his company to end in a gunfight against Sitting Bull and the Sioux, it instead turned into a comic western. Johnson is stranded in Deadwood with his bones, which everyone assumes is a cover for gold. Some readers may be pleased to learn that the Bone Wars between Cope and Marsh are drawn from history. Robert Louis Stevenson and Wyatt Earp also appear. At some point I accepted that even though it details how to dig up fossils, Dragon Teeth is not a technothriller. It’s more of a coming of age novel. And I think it’s intended as a sort of romp. The bickering between Cope and Marsh is supposed to be funny, as are almost all of Wyatt Earp’s actions in the text. To be perfectly honest, I don’t like romps — I don’t even like the word romp — and they’re not what I look for in a Michael Crichton novel about dinosaurs, or even dinosaur fossils. It feels uncomfortable to dislike a posthumously published novel. In this case, it’s not clear to what extent the story was finished, nor is it clear at what time in Crichton’s career he produced it. The author’s bio in the dust jacket mentions that he directed the original Westworld film, a minor achievement in Crichton’s career, but a topical one now that it has been adapted for TV by HBO. That may explain why this story about Bone Wars and the frontier is being published now, after Micro and Pirate Latitudes. Regardless, fans of his earlier historical novels, Eaters of the Dead and The Great Train Robbery, will likely enjoy this novel more than fans of Westworld. As for me, I came to Dragon Teeth as a fan of Crichton’s science fiction and was disappointed. Published May 23, 2017. Michael Crichton, the #1 New York Times bestselling author of Jurassic Park, returns to the world of paleontology in this recently discovered novel—a thrilling adventure set in the Wild West during the golden age of fossil hunting. The year is 1876. Warring Indian tribes still populate America’s western territories even as lawless gold-rush towns begin to mark the landscape. In much of the country it is still illegal to espouse evolution. Against this backdrop two monomaniacal paleontologists pillage the Wild West, hunting for dinosaur fossils, while surveilling, deceiving and sabotaging each other in a rivalry that will come to be known as the Bone Wars. Into this treacherous territory plunges the arrogant and entitled William Johnson, a Yale student with more privilege than sense. Determined to survive a summer in the west to win a bet against his arch-rival, William has joined world-renowned paleontologist Othniel Charles Marsh on his latest expedition. But when the paranoid and secretive Marsh becomes convinced that William is spying for his nemesis, Edwin Drinker Cope, he abandons him in Cheyenne, Wyoming, a locus of crime and vice. William is forced to join forces with Cope and soon stumbles upon a discovery of historic proportions. With this extraordinary treasure, however, comes exceptional danger, and William’s newfound resilience will be tested in his struggle to protect his cache, which pits him against some of the West’s most notorious characters. A page-turner that draws on both meticulously researched history and an exuberant imagination, Dragon Teeth is based on the rivalry between real-life paleontologists Cope and Marsh; in William Johnson readers will find an inspiring hero only Michael Crichton could have imagined. Perfectly paced and brilliantly plotted, this enormously winning adventure is destined to become another Crichton classic. I recall seeing somewhere (back in late April/early May 2017) that this novel’s manuscript was written by Crichton back in the 1970s, stuffed into a desk, and never touched by his living hand again. If true, I think that would explain a lot of your complaints about the novel, Ryan. Interesting. To be honest, I didn’t search very diligently for that information. If his estate wanted readers to receive the novel under the circumstances that you describe, they might have included an introduction.